^ a b "Amy Goodman Biography". Encyclopædia Britannica Online. Encyclopædia Britannica. April 6, 2018. Retrieved 2019-01-24. ^ Grueskin, Caroline (17 October 2016). "Protest winds down at Morton County Courthouse". Bismarck Tribune. Retrieved 17 October 2016. ^ Levin, Sam (17 October 2016). 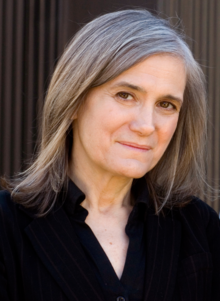 "Judge rejects riot charges for journalist Amy Goodman after oil pipeline protest". The Guardian. Retrieved 17 October 2016. ^ Hiltzik, Michael (17 October 2016). "N. Dakota charges reporter with 'riot' for covering protest--but gets slapped down by judge". Los Angeles Times. Retrieved 17 October 2016. ^ Greenberg, Will (17 October 2016). "Judge Throws Out Charges Against Journalist Who Covered Dakota Access Pipeline". Mother Jones. Retrieved 20 October 2016.